So when I say anytime, I really do mean anytime. There are no cutting boards involved. There is no splattery sautéing. THEY GO WITH ANYTHING, anytime. I’m not a meatball lover, but I LOVE THESE MEATBALLS. 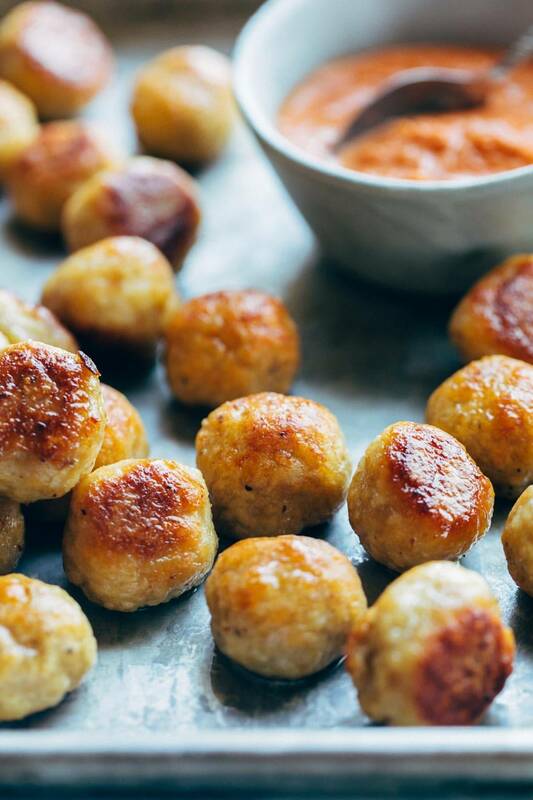 These baked chicken meatball bites can go with spaghetti and meatballs, baked rigatoni, or any pasta for that matter. They can be served with mashed cauliflower and green beans (my current favorite), or saved for quick and healthy lunch meal prep with roasted veggies. Half of the batch can be tossed with buffalo sauce and half can be frozen for next week’s Swedish meatball dinner. I don’t memorize many recipes – I have the magic green sauce, soft chocolate chip cookies, and wild rice soup burned into my brain, but that’s about it. THAT BEING SAID, this baked chicken meatball recipe is absolutely a memorize-the-general-concept-and-make-it-anytime type of situation. See? Anytime. I told you I was serious about that part. K, the recipe is such a breeze. Are you ready? First, your ingredients. Just pile ’em in a bowl. 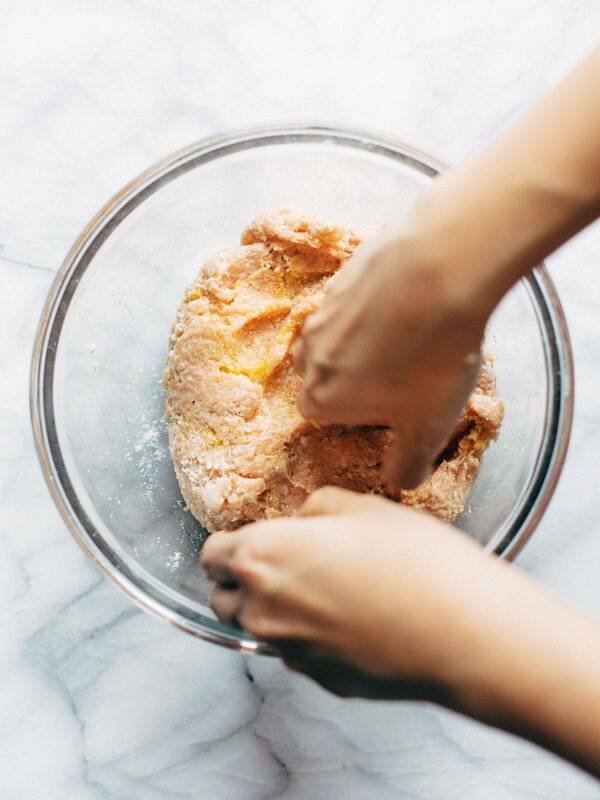 All you really need to remember is panko, parm, egg, and chicken. The spices are pretty flexible. Now OBVIOUSLY WASH YOUR HANDS and take off your rings and all that. And then dive in. Mix, roll, roll, roll. And bake. Put your feet up, relax for a minute, smell the deliciousness coming from the oven. One of my favorite things about these is that even with being baked, they get a really nice browned exterior. You can always throw them in a saute pan if you feel like they need a little extra browning, but I will legit eat these straight off the baking sheet. Browned to perfection, if you ask me. Okay, so what are you going to make with these? 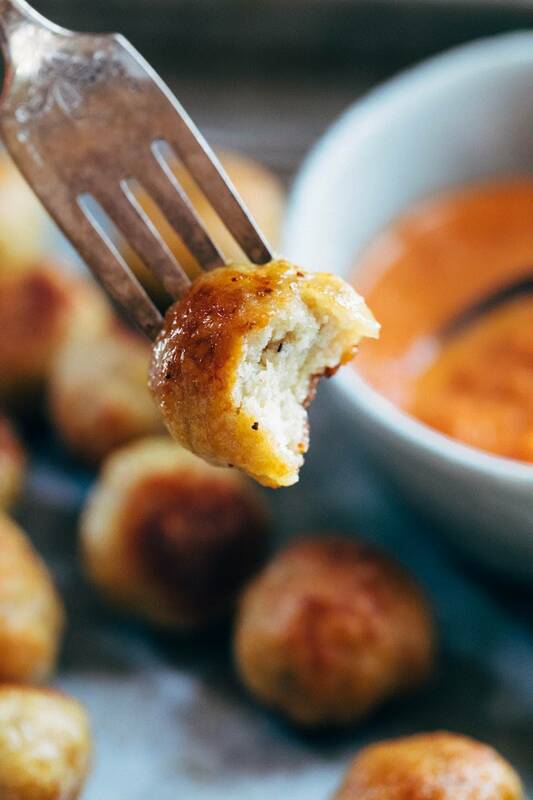 Because these are the little baked chicken meatballs that could! They can be anything they set their minds to. An-y-thing! 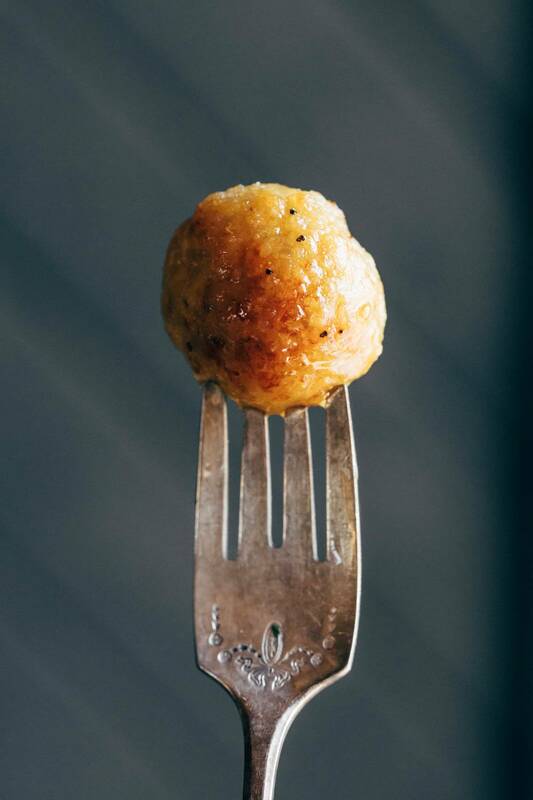 These Baked Chicken Meatballs are the BEST! The perfect addition to any meal or to eat right on their own. Bonus: they’re meal-prep friendly to stock up throughout the week! Prep: Preheat the oven to 400 degrees. 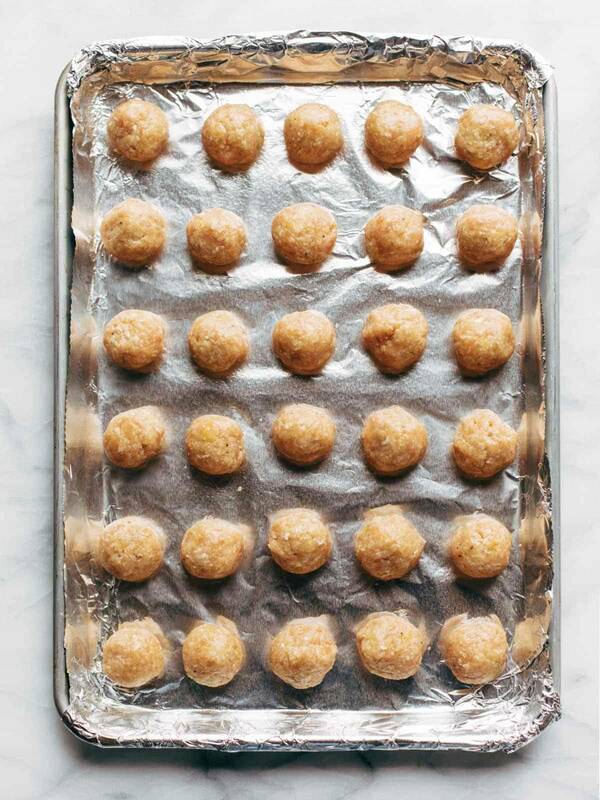 Line a baking sheet with foil and a little cooking spray. 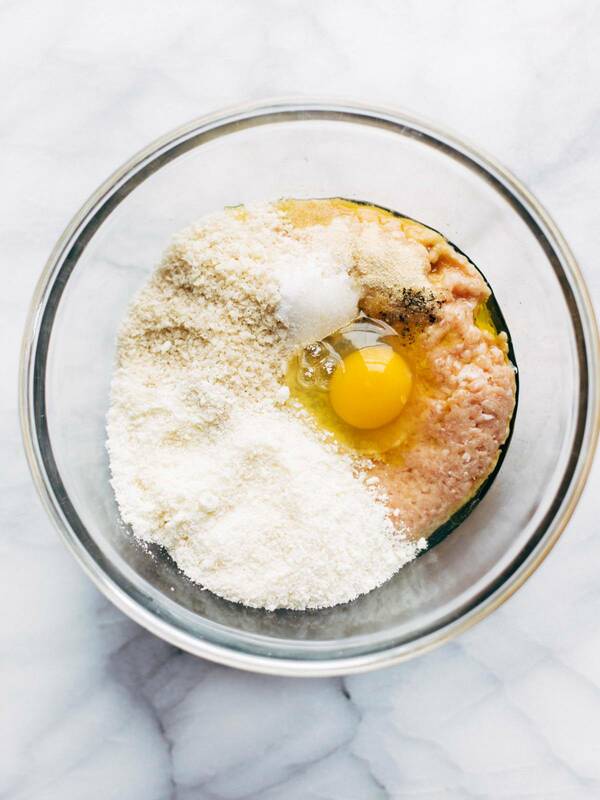 Mix: Mix all the ingredients together in a mixing bowl. Roll: Roll the mixture into about 30 small balls. Place on baking sheet. Bake: Bake for 25-30 minutes. I really love making this with ground chicken OR ground turkey. If I use ground turkey, I like the dark meat ground turkey that they sell at Whole Foods. For mixing, I usually wash my hands, take my rings off, and mix it all up with my hands. I prefer chunk-less meatballs when it comes to onion and garlic which is why I prefer to use powder. But if you like to have the chunks, I think you could use finely minced fresh garlic and onion with good results! The sauce pictured here is a store-bought vodka sauce from DeLallo! It’s delicious. View the freezer meal version of this recipe here. You might also like our full freezer meals post. So easy and so delicious! We tossed them sith some whole wheat penne, garlic marinara, and fresh grated parmesan. Healthy comfort food is amazing. Thanks for this recipe! Yum! Glad to hear it, Colleen! I made this last night and it was requested these go in the weekly rotation and to please double the recipe! Great one! I did substitute almond flour (GF) and they are awesome! These are SCRUMPTIOUS! I doubled the recipe and made bigger meatballs (baked for 35 min.) They’re my new fave!! what would be another good sauce to have with these i can make? These were AMAZING!! I made them last night, and added a tsp of dried parsley. Hubby (who will only ever do meatballs in ground beef form) loved these and said he would eat again. Thank you for such a great recipe!! Glad to hear that, Rachael! I just made these and they turned out dry and not perfectly round like yours… I used 100% white meat chicken breast, but the mixture was so sticky that I wasn’t able to get them perfectly round and by the time they got brownish like yours they had a crust, rather than a nice sheen. I added the olive oil like you suggested, what did I do wrong? These are great, but mine didn’t turn out as pretty as yours. What’s your secret? Is that before or after you bake them? I made it today and it is beyond delicious. Easy to make, and on side I made garlic sauce dip. Yum! Glad you enjoyed it! 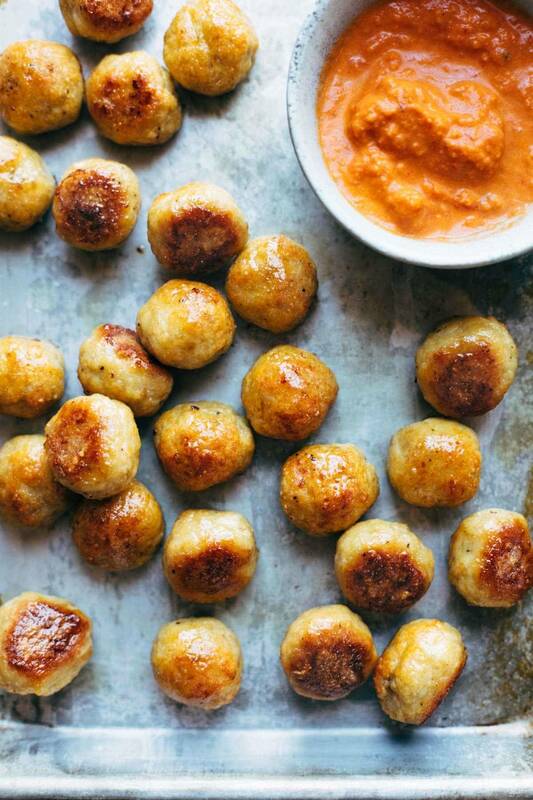 What sauce do you use to dip the meatballs? There’s a yummy looking sauce in your pics! Can’t wait to try this! It’s a creamy vodka sauce from DeLallo! you know, i cooked these – on 400, as directed, and even made them larger than was suggested (which should mean it would take longer to cook), and they turned out hard and nearly inedible. I am disappointed, as they had the potential to taste great, but the high temp + bake time did not work for me. I would appreciate your feedback. Thanks! Some almond meal or almond flour might do the trick! Made this recipe with ground turkey, and YUM! Absolutely delicious, super easy to make and made a double batch for left overs :)! Glad you enjoyed it, Jenn! These were an absolute hit! Thank you! So simple, so good! Glad to hear it, Carolina! Reading this recipe made me so hungry! I can’t wait to try it! I made these with ground chicken for dinner last week. These are phenomenal! I will be making these again very soon! Your recipes are the best! Thanks for the comment, Katie! They throw together super quick too! Definitely going on the dinner rotation! Made these tonight, and all 5 of the picky eaters here asked for seconds. They will definitely be in the regular rotation at our house so quick and easy and tasty. And healthy! These were really good and my kids loved them! Thank you for the awesome recipe! Hi there- I have a son who has dairy and egg food allergies. Any thoughts on what you could sub for the egg and parm? Desperately seeking recipes for him. Thanks! Firstly, I don’t like meatballs. Secondly these were amazing, something about how brown and crispy they looked after the oven really made me want to try them. They were so fast and so delicious. Also you must try them tossed in buffalo sauce!! Glad you enjoyed them, Michael!